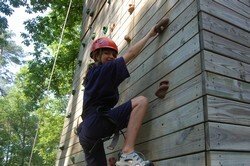 Some groups choose to add one or more of Nature’s Classroom’s optional adventure activities. These activities provide a great opportunity for participants to challenge themselves and gain a sense of personal accomplishment and growth. All challenge activities at Nature’s Classroom operate under Challenge By Choice ethics, which emphasize participants setting their own goals, choosing their own level of challenge, and creating an atmosphere in which everyone feels comfortable pushing themselves to do their best! Archery: Certified instructors teach participants the basics of this ancient skill and the group tests their technique on our archery range! 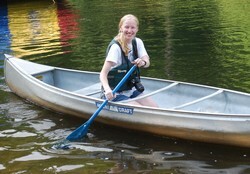 Canoeing: Under the watchful eye of a lifeguard, participants learn the parts of a canoe and practice basic strokes & technique on the beautiful section of the Little River that flows through our facility! Climbing Tower: Participants are challenged to set and reach their goals as they strive for each handhold that will take them higher and higher up the multiple routes on our Climbing Tower! 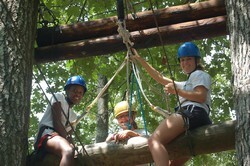 Pamper Pole: The first part of this challenge is to climb and stand on top of a telephone pole. Then participants leap for a trapeze suspended a short distance away! Swing By Choice: The group must work together to pull each participant up to the height of their choice before they count down, pull the rip-cord, and take a thrilling swing! V-Swing: To reach the V-Swing participants must first cross a horizontal telephone pole, followed by a cable bridge, and then negotiate around a cargo net, before finally swinging back to the ground! Zipline: Participants climb steel staples up the trunk of a tree and high into the treetops before descending down our 400-foot-long Zipline!